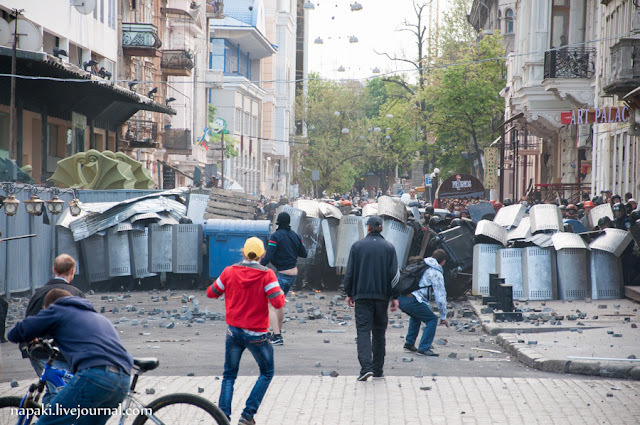 Members of a civic initiative investigating the tragic disturbances and fire on 2 May 2014 have blasted Ukraine’s law enforcement bodies and leadership over the failed investigation. The 2 May Group also warns that the situation now is even more dangerous than it was on the eve of the events which claimed the lives of 48 people. It places the blame for this firmly on those politicians who, for their own political ends, have an interest in destabilizing the atmosphere in the city. At a press conference on the eve of the second anniversary, the 2 May Group said that the police investigators involved in the investigation during 2014-15 should hand back their pay, since they assuredly did not earn it. More has been achieved in the two months since the case was passed to Odesa investigators than over the previous year and a half. Ironically, the transfer may have been a banal attempt to find scapegoats. This, thankfully, backfired, with the new investigators finally showing an interest in getting proper results. The lack of any will among law enforcement body management to effectively investigate the events had long been noted, as well as likely motives for the procrastination. In a report issued on Nov 4, 2015, the Council of Europe’s International Advisory Panel clearly stated that, given evidence suggesting some police complicity, as well as omissions, and the failure of the emergency services to respond in time to the fire, the investigation needs to be carried out by a body independent of the Interior Ministry. Six people died of gunshot wounds during the disturbances in the centre. Although the riots began because of a deliberate attack by a large crowd of pro-Russian activists from the Odesskaya Druzhyna, weapons were later used by both sides. 42 people, all pro-Russian activists died as the result of a fire in the Trade Union Building on Kulikovo Pole. Russia began a concentrated propaganda campaign from the first days, claiming the events to have been a ‘massacre’. It has systematically pushed this line both in the Russian media and abroad. The lies have been exposed and refuted time and time again, in particular by the 2 May Group and the International Advisory Panel. Whatever his motives, the propaganda version was recently made into a film by French filmmaker Pierre Moreira and shown first on French, then Polish television. A planned showing on Swedish TV on the eve of the anniversary was, however, postponed due to protests from media and human rights organizations. Ukraine’s authorities needed to knock such propaganda on the head immediately by ensuring a swift and transparent investigation. Instead, during the first two weeks the Interior Minister Arsen Avakov and some other top officials themselves spread nonsense about toxic substances having been used and direct Russian involvement. Avakov’s other actions during the first days were also at very best unfortunate. Without any investigation having been carried out, he suspended the head of the regional police Petro Lutsyuk and placed his deputy Dmytro Fuchedzhy in charge. This was baffling since Fuchedzhy had actually been answerable for public safety that day, and footage was being widely circulated from the outset suggesting his questionable role in the earlier disturbances. Fuchedzhy was responsible for releasing a large number of suspects on May 4 and is now in hiding in Russian-controlled Transnistria. There were effectively no attempts made to cordon off the areas – Hretska Square and the Trade Union Building in particular, despite the obvious need to gather vital evidence. The investigators never asked to see CCTV footage, nor mobile telephone records. 2 May Group member Vladislav Serdyuk, himself a retired police colonel, stresses that many crucial details could have been established immediately had people like Lutsyuk, Avakov and his deputy been questioned properly. It is clear that a key flaw in this whole investigation is that the Interior Ministry was left to investigate its own failings. The investigation as a result was not just bungled, but sabotaged. Key issues must be why an anti-riot action plan which had been fully agreed was never implemented, and why Volodymyr Bodelan, the head of the emergency services effectively prevented fire engines being sent to Kulikovo Pole for 40 minutes. Charges were laid many months later against Lutsyuk over the failure to implement the action plan. In fact, the 2 May Group is convinced that Lutsyuk had coordinated this omission with somebody high up in the Interior Ministry. The situation with the emergency services is particularly disturbing and the International Advisory Panel understandably called the failure to properly investigate the fatal delay “the most striking example of a lack of diligence”. Nor has belated activity improved things, quite the contrary since there is every indication that the chief suspect has been allowed to escape justice. Three emergency services officials were charged at the end of February 2016 under Article 135 § 3 of the Criminal Code (leaving people in danger), with a possible sentence of between 3 and 8 years. Viktor Hubai, deputy head of the Emergency Services Regional Department was remanded in custody, while the head of the shift Yury Shvydenko and assistant Svitlana Koyeva were placed under house arrest. It is Koyeva’s voice that can be heard on the tape ignoring the calls for help. It is quite likely that Bodelan will push his claims about a fire crew having been sent, but obstructed by aggressive protesters, to Russian propaganda channels. His assertions have been rejected by the 2 May Group and now by the testimony of his former subordinates. In November 2014, a former advisor to Avakov publicly claimed that “the 2 May investigation” had been completed and passed to the court. He was referring to the prosecutions of 22 people held then in custody. Only one of the men is believed to have played a major role and the charges were vague and basically copy-pasted 22 times. By hurriedly passing this nonsense to the courts, a real investigation has effectively been obstructed, and the case has already been sent back twice due to the obvious flaws. A number of key suspects have also been included in exchanges for Ukrainians held prisoner by the Kremlin-backed militants in Donbas. Such earlier exchanges were strongly criticized by the International Advisory Panel. Only one person, Serhiy Khodiyak (a Euromaidan activist) is directly charged over at least one death, yet that case is also unlikely to result in a conviction with the weapon he allegedly used not having been found. The 2 May Group points out that they have repeatedly passed evidence in the form of video recordings, interviews, assessments and their documentary film to the Interior Ministry’s CID and to the Prosecutor General’s Office. They have even managed to identify the individuals and vehicles used to allow Vitaly Budko (Botsman), a key murder suspect to escape and weapons to be taken away. No interest has been demonstrated. As if all this mess, against an unrelenting propaganda campaign by Russia, were not enough, members of the 2 May Group have also warned that local politicians are now seeking to stir up the situation. Two years ago, the impetus for destabilization came from highly marginal groups. Even if they were receiving backing from outside, they did not get local backing with most political forces concerned only about the coming elections. Now there is a battle for power underway in Odesa, with the key players willing even to use dangerous, potentially bloody, disturbances.